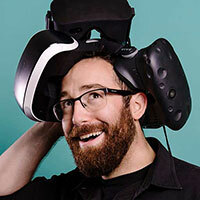 Alex Schwartz is previously Founder, CEO and Janitor of VR studio Owlchemy Labs, creators of the award winning Job Simulator and Rick and Morty VR. Today, he's co-founding a new *secret* company as well as advising companies and events such as VRDC, DICE Awards, and BAFTA Game Awards. Alex plays an active role in the gaming and VR community by speaking around the world, organizing events. When he's finally back home in Boston, he can be found in the backyard smoking various exotic meats.